70-year-old Sreeman Narayanan, resident of Muppathadam in Ernakulam district, is also an award winning writer and wholesale lottery dealer. The Eloor-Edayar industrial belt in Ernakulam district is often in the news for the pollution of the Periyar River which passes through the region. But in a small village called Muppathadam in this industrial belt, lives 70-year-old Sreeman Narayanan, who has been functioning as a one-man army to protect nature. 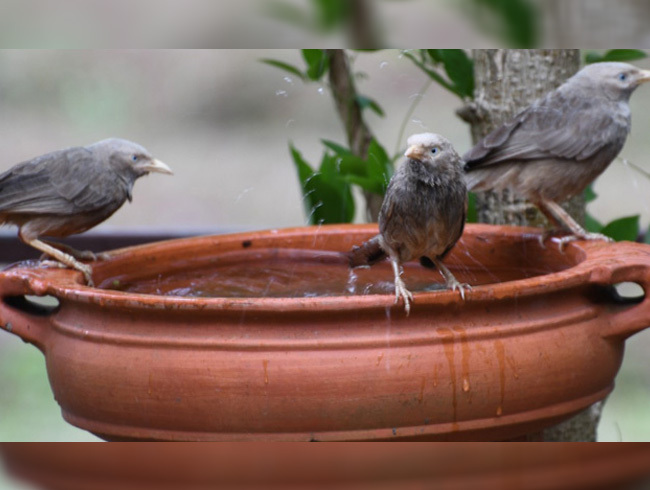 With summer intensifying, he is on a mission to distribute 10,000 earthen pots for free to people who are willing to provide water for the hapless birds reeling under the scorching heat. “With summer worsening, most of the water sources of the birds have dried up. Not only humans, but animals too get affected due to the increase in temperature and suffer from dehydration. From this single mud pot, at least 100 birds can drink water,” says Sreeman. From an award winning writer to a wholesale lottery dealer, Sreeman wears many labels. But he likes to be known as a person who has embraced the Gandhian way of living. About 9,000 pots have already been distributed to residential associations, clubs and educational institutions. The project titled 'Jeeva jalathinu oru manu pathram', meaning ‘an earthen pot for life saving water’, was initially started in 2018. With its huge success, Sreeman decided to restart it this summer. “Since most of the pots have already been distributed, I have ordered for more earthen vessels to continue this,” he adds. To buy 10,000 earthen pots, it cost Sreeman Narayanan about Rs 6 lakh. “I have completed my responsibilities as a father by taking care of my three children. They are living a peaceful life now. And I do not want to keep savings for the future ignoring the present destruction of the earth. So, I make use of the income that I get from my lottery business and the small restaurant I run in the village,” says the proud father who brought up his three girls after the death of his wife 30 years earlier. Last year, Sreeman distributed 50,000 saplings worth 15 lakh across the district free of cost. “Before that I had personally planted about 10,000 trees across the houses in my village in Muppathadam. While planting the trees I also made it a point to get assurance from the families that they will keep the fruits of at least one tree in each compound for birds,” said Sreeman. Inspired by the life of Gandhi at an early stage in his life, Sreeman lives by the Gandhian principle that his life should be a message to the world. Sreeman has been engaged in all his social work under the banner 'Ente Gramam Gandhijiyilude', meaning my ‘My village through the ways of Gandhiji’ for the past six years. He started full-time social work by distributing about 5,000 copies of The Story of My Experiments with Truth, Mahatma Gandhi’s autobiography. dual postgraduate degree holder in Malayalam and Economics, Sreeman bagged the Kerala State Institute for Children’s Literature award in poetry for his work Kuttikalude Gurudevan in 2016. He has also written a couple of other books, of which Ente Puzha, written against the background of pollution in the Periyar river is the most recent. Recently, he bagged the SK Pottekkatt award for his efforts to protect the environment.